After reading on several blogs that this was a book worth getting I decided to get myself a copy. I will say that this is a great book and that it should be on every programmer’s bookshelf. This is right up there with Code Complete. If you have not already gotten a copy you should do so. When it comes to technical books I like to only purchase books that I will continue to use over the years vs ones that are very targeted and will go out of date. Thus architectural books are a prime candidate for purchase. However knowing which to buy can be daunting. After all who wants to plop down $50 or more for a book that might only have 1 or 2 good chapters in it or is a rehash of books you already have. That’s where these reviews come in. I picked up this book based on reviews on other blogs and I was not disappointed. While the information in the book is presented by an obvious Java programmer it in no ways is tied to Java programming. It provides insight into several projects from the real world and things that they learned from them. As such it is more of a best practices book vs a code book. 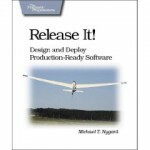 From Anti-Patterns to Patterns it walks you through various scenarios and things to watch out for when developing release ready software. After reading the book myself I was able to make changes to the way I was coding my components to take advantage of these patterns. By making use of this pattern I was able to take a service interface layer and change it such that the application using it would not crash from this component as it had done in the past. I was able to accomplish this by using the circuit breaker pattern that he describes in his book. Basically what it does is very much what you would expect. Just like in a home if you plug too many items into your outlet and it overloads the circuit it throws the breaker so you don’t burn your house down. So in code what this does it allows you to implement your code such that if you run into problems it can shut down the interface or process without taking down your application with it. After all who wants to crash their application or website because an integration point is down or broken. There are quite a few other patterns some of which I have already taken advantage of like the Fail Fast pattern. I can honestly say that after reading this book almost any developer should be able to walk away a better programmer and will most likely start to use some of the patterns presented in this book. I know I have. All in all this was an excellent book and it was written very well and not all that expensive. If you would like to see a more in-depth review see this blog post, Ayende’s Blog.